Both sexes: Grey-brown and whitish mottled plumage. 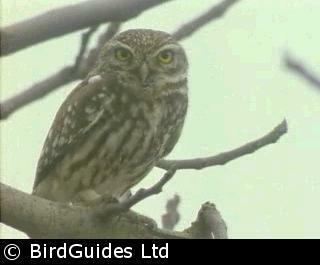 The Little Owl is much smaller than the Tawny Owl, indeed, it is only about the size of a Mistle Thrush. The upperparts, wings and crown are grey-brown or brown and mottled with white; the underparts are whitish with brown streaks. The yellow eyes and the thick whitish eyebrows give it a fearsome look. The legs and feet are feathered. The sexes are alike though the female is usually a little larger than the male. Juveniles are similar but duller and do not have white speckles on the crown. Little Owls are often active during the daytime and can often be seen perched on branches close to the trunk, fence posts, or walls out in the open. When excited or alerted, the Little Owl bobs its head up and down, which helps it judge distance, etc. Their flight is very undulating, similar to that of woodpeckers, and quite low over the ground. Both birds give a loud mewing call, "kee-ew"; often during the day and especially during courtship (March-April). The male's song is mournful hoot, "woop", which is repeated every few seconds. They feed mainly on insects (beetles, moths and spiders) and earthworms, but also small birds, amphibians and mammals, such as shrews. The prey is often captured by the bird dropping from a perch. Little Owls breed in copses, hedgerows, parks and gardens in otherwise quite open country. They nest in a hole in a tree or building, or even nest boxes. The hole is left unlined. The female alone incubates the eggs, which are white, smooth and non-glossy, and about 36 mm by 29 mm. The newly-hatched young are fed by both adults. The Little Owl is resident and, apart from young birds dispersing from their natal sites, they do not move far from their nest sites. The Little Owl became resident by the early 1900s after several earlier unsuccessful attempts to introduce this European owl to Britain during the 19th century. The European population has declined in the last few decades, but the UK population appears to be doing well.